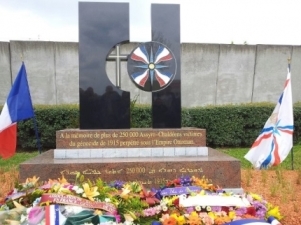 (AINA) -- A memorial to the Assyrian victims of the Genocide perpetrated against Assyrians, Greeks and Armenians in World War One by Ottoman Turks was erected yesterday in the town Arnouville, outside of Paris. The Genocide, which began on April 24, 1915 and lasted until 1918, claimed the lives of 750,000 Assyrians (75%), 500,000 Greeks and 1.5 million Armenians. According to the Assyrian Genocide Research Center, "this is a historical day for the Assyrian nation, to commemorate the victims of the genocide and to point out the current atrocities brought upon the ancient St. Gabriel Monastery by the so called "modern" Turkey." The St. Gabriel Monastery, founded in 397 A.D., has been embroiled in a legal battle over its land, with the Turkish government attempting to seize the Monastery's lands (full coverage). The Monastery is located in the Tur Abdin plateau near Midyat in the Mardin Province in Southeastern Turkey. Paris is host to a large community of Assyrians, most of whom having arrived during and after World War One, to escape the Turkish genocide.